Hi, everyone! In this article I will continue to publish my research of Lenovo ThinkPad’s firmware. 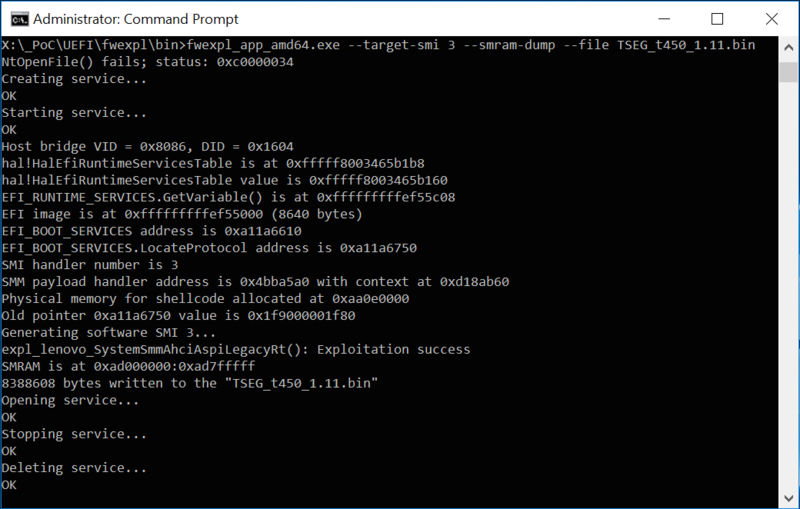 Previously I shown how to discover and exploit SMM callout vulnerabilities on example of SystemSmmAhciAspiLegacyRt UEFI driver 1day vulnerability. Also, I introduced a small toolkit called fwexpl that provides API for comfortable development of firmware exploits for Windows platform. My previous Lenovo exploit was able to execute custom code in SMM, such conditions allow relatively easy bypass of BIOS_CNTL security mechanism which protect firmware code stored inside SPI flash chip on motherboard from unauthorized modifications by operating system (BIOS_CNTL bypass also was discussed in my another article "Breaking UEFI security with software DMA attacks"). In addition to BIOS_CNTL, modern Lenovo computers also use SPI Protected Ranges (aka PRx) flash write protection, so, in this article I will present my generic exploitation technique that allows to bypass PRx and turn arbitrary SMM code execution vulnerability into the flash write protection bypass exploit. This technique also can be applied to UEFI compatible computers of other manufacturers — they all use similar design of specific firmware features that responsible for platform security. 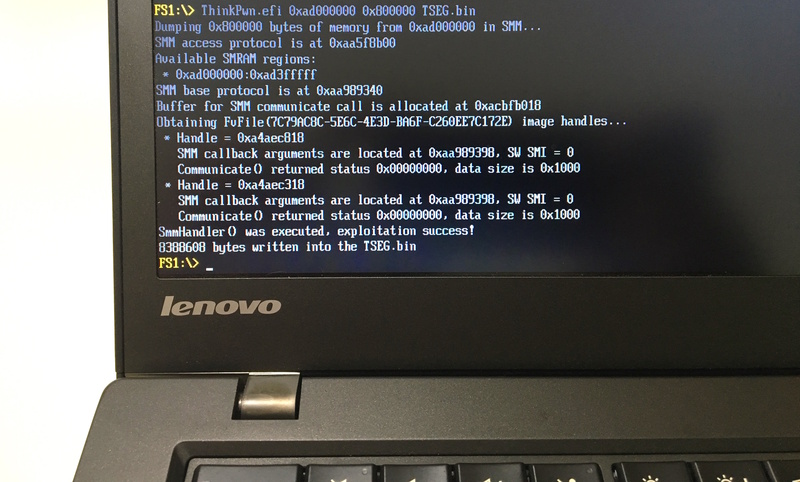 In second part of the article I will present a new 0day vulnerability in Lenovo firmware that allows arbitrary SMM code execution on a wide range of Lenovo models and firmware versions including the most recent ones. Exploitation of this vulnerability may lead to the flash write protection bypass, disabling of UEFI Secure Boot, Virtual Secure Mode and Credential Guard bypass in Windows 10 Enterprise and other evil things. BIOS_CNTL register of Platform Controller Hub (PCH) that accessible via PCI configuration space — one the oldest flash write protection feature that was introduced a long time ago. This register has BIOS Write Enable bit (BIOSWE) — when it’s clear only read access to the flash is allowed. BIOS Lock Enable bit (BLE) enables raising of System Management Interrupt (SMI) on every attempt to set BIOSWE. Once BLE bit is set — it can’t be modified till the next platform reset. 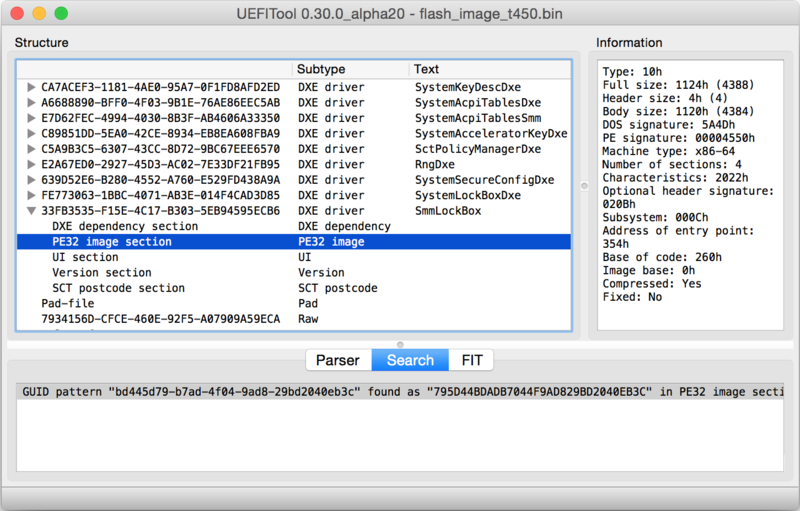 Modern UEFI compatible firmwares usually set BIOSWE bit to zero and BLE bit to one during platform initialisation, in addition with SMM_BWP bit of the same register it allows to block write access to the flash from non-SMM code. SPI Protected Ranges (PRx) — newer althernative flash write protection mechanism. It has some advantages over BIOS_CNTL: possibility to set write protection only on some certain parts of the flash chip (which is very useful for OEM’s which want to use single flash chip for firmware code and NVRAM), and the fact that PRx works independently from SMM code, so, in theory it allows to protect the flash chip even from unauthorized modifications by attacker who has access to System Management Mode. Boot Guard — relatively new feature of Intel processors that was designed to solve a bit different task, prevent execution of unauthorized firmware code even if attacker managed to write it to the flash. Boot Guard uses public part of Intel key fused into the CPU to verify digital signature of early stage firmware code before it’s execution, this code must verify the rest part of the platform firmware to make Boot Guard have a sense. There was a lot of public discussions around this feature because de-facto it prohibits customers to use open source platform firmware like coreboot. Different OEM’s can use one of these mechanisms or several of them. For example, my Intel DQ77KB motherboard from "Exploiting UEFI boot script table vulnerability" article uses only BIOS_CNTL flash write protection. One of my laptops, Apple MacBook Pro 10,2 is implementing flash write protection using PRx only. My current target, ThinkPad T450s is using both of them. Boot Guard is out of scope of this article — it deserves a separate research. Also there’s almost no information about Boot Guard support in mass market computers. At this moment there aren't any official or unofficial specifications on Boot Guard itself, Intel released only very brief description that doesn’t even provide enough of information to check if your platform has active Boot Guard. In "How many million BIOSes would you like to infect?" whitepaper LegbaCore claims that Boot Guard support is present at least in following ThinkPad laptops: T440, T440p, T440s, T440u, T450, T450s, T540, T540p, T550, W540, W541, W550s, X1 Carbon (20Ax and 20Bx), X240, X240s, X250 and Yoga 15 / S5 Yoga. Last generation ThinkPad models are shipped with Skylake microarchitecture chips which are available at the market and likely have enabled Boot Guard. 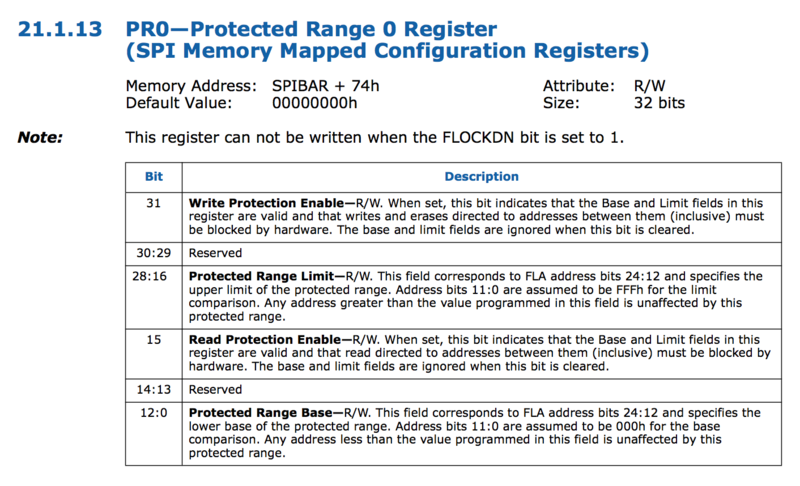 SPI Protected Ranges are configurable via memory mapped registers of SPI Host Interface which belongs to Root Complex Register Block (RCRB), a special set of registers that used to configure so called Root Complex — device that connects CPU and memory subsystem with PCI Express switch fabric. On modern Intel processors Root Complex is integrated into the CPU. "Intel® 8 Series/C220 Series Chipset Family Platform Controller Hub (PCH) Datasheet"
"Desktop 4th Generation Intel® CoreTM Processor Family Datasheet"
PRx (offset) | Value    | Base     | Limit    | WP? | RP? As you can see — CHIPSEC reports that everything is fine, T450s firmware has properly configured BIOS_CNTL bits and also it defines two write protected regions of the flash chip located at address range 0xa00000 — 0xe2ffff (PR4, PR3, PR2) and 0xeb0000 — 0xffffff (PR1). First of all, to break PRx flash write protection we need to have some code to determinate current values of PR0-PR4 registers. For this work I will use libfexpl library that was introduced in previous article, it’s API allows to do such things in relatively user friendly way. When FLOCKDN bit set it’s not possible to change PR0-PR4 registers values until the full reset, so, the most obvious weakness of the PRx flash write protection is the way of how exactly they are set by platform firmware during boot. Besides normal boot path modern ACPI compatible computers firmware also implements a separate boot path for S3 resume that used when computer wakes up from S3 sleep — a special power state when the most of platform components are powered off (S4 and S5 resume are implemented in normal boot path, S1 and S2 resume is not used on most of Intel platforms). UEFI firmware has a special data structure called UEFI Boot Script Table that survives S3 sleep, it used to save platform registers values during normal boot path and restore them during S3 resume. Boot Script Table is stored in memory, so, if attacker is able to modify it from running operating system and trigger S3 suspend-resume — he will have a possibility to override the values of certain system registers that responsible for platform security. Firmware of some vendors doesn’t lock some of these certain registers before execution of Boot Script Table, flaws of this type are known as "UEFI Boot Script Table vulnerability" — I already wrote an article about it’s exploitation in normal conditions (i.e., from running operating system). To protect platform from such attacks UEFI specification introduced a special mechanism called SMM LockBox, it used to store Boot Script Table in System Management RAM (SMRAM) — memory region that accessible only for SMM code of platform firmware but not for operating system that runs during runtime phase. EDK2 code base provides a reference implementation of SMM LockBox drivers, it’s detailed description can be found in document called "A Tour Beyond BIOS Implementing S3 Resume with EDKII". However, specific OEM or IBV may use their own SMM LockBox that has a lot of differences with reference code. Make a special early stage UEFI driver that locks all of the necessary stuff before Boot Script Table execution. This way is the most secure one, but it’s also less convenient for developers because it puts it’s own limitations on the design of platform initialization code. Restore certain register values using Boot Script Table stored in SMM LockBox — this way is more easy to implement but it doesn’t help when SMM code is one of the parts your threat model. Because I already have nice and reliable 1day exploit that allows to execute arbitrary SMM code on a lot of Lenovo computers I decided to do reverse engineering of SMM LockBox used in my ThinkPad T450s firmware to check if it’s possible to use a Boot Script Tbale stored there to override PR0-PR4 registers with some incorrect values during S3 resume. Using my 1day exploit for Lenovo firmware vulnerability we easily can read or write a whole SMRAM contents. To play with UEFI Boot Script Table we need to know how exactly SMM LockBox driver stores it into the SMRAM, then we will able determinate it’s location from our own code. As you can see, this module is implementing a typical SMM/DXE combined UEFI driver — I already explained how they work in my previous article "Building reliable SMM backdoor for UEFI based platforms". In a few words, firmware code loads this driver two times — as normal DXE driver and as SMM driver that runs from SMRAM. InSmm() function of EFI_SMM_BASE_PROTOCOL is used by driver code to determine how exactly it was loaded. // Check if caller buffer contains specific GUID at offset 24. // It allows to prevent arbitrary memory overwrite vulnerabilities. Obviously, Intel approach is much more adequate — it doesn’t rely on any magic values like Lenovo one does (attacker is still able to overwrite some small subset of memory locations that actually begin with the same bytes as hardcoded GUID that SMM callback checks for). Second interesting thing from sub_674() decompiled code — it definitely implements a switch-case that used to dispatch SMM LockBox commands very similar to EFI_SMM_LOCK_BOX_COMMAND_SAVE, EFI_SMM_LOCK_BOX_COMMAND_UPDATE, EFI_SMM_LOCK_BOX_COMMAND_RESTORE, EFI_SMM_LOCK_BOX_COMMAND_SET_ATTRIBUTES and EFI_SMM_LOCK_BOX_COMMAND_RESTORE_ALL_IN_PLACE which can be found in SmmLockBoxHandler() function of EDK2 mentioned above. 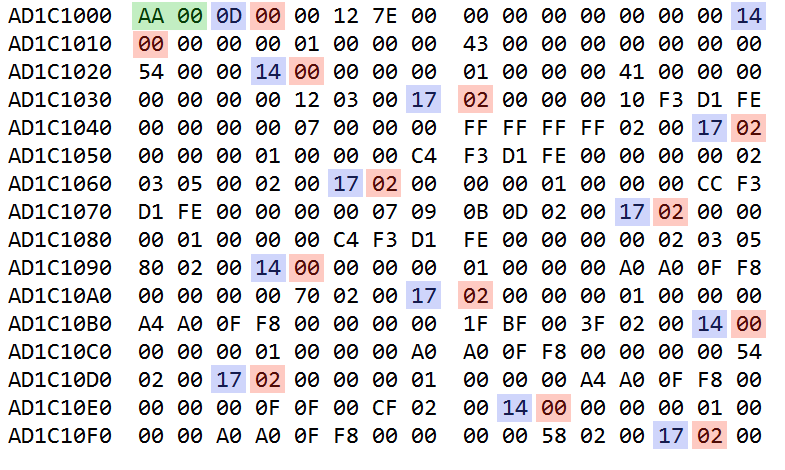 The actual thing is happening in sub_BE4() function that allocates two areas of SMRAM memory. First one is allocated with EFI_SMM_SYSTEM_TABLE.SmmAllocatePages() call, it used to store a copy of Boot Script Table which address comes from SMM callback input. Second one is allocated with EFI_SMM_SYSTEM_TABLE.SmmAllocatePool() call, it used for structure that keeps Boot Script Table copy address and it’s size, 'LOCKBOXD' signature, etc. Then code calls sub_9FC() function to obtain some internal structure address with pointer to the EFI_LIST_ENTRY head and adds previously allocated lockbox structure to the double-linked list. This UEFI SMM configuration table with pointer to the double-linked list head can be easily found using our own code thanks to the SMM LockBox GUID and constant signature 'LOCKB_64' at the beginning of the configuration table. This structure begins with 0xaa signature as well as the Boot Script Table used in EDK2 implementation of S3 resume boot path. However, the Boot Script Table format is significantly different from other format that I have seen previously (apparently, this one was optimized to make it smaller because SMRAM memory is limited system resource). I decided to implement functionality that reads and writes Boot Script Table stored in SMM LockBox on the top of my previous 1day exploit for Lenovo SMM callout vulnerability. Source file application.cpp already has phys_mem_read() and phys_mem_write() functions that exploit the vulnerability to read or write physical memory from System Management Mode — it should be enough for our purposes. To make my code more reliable I made a simple macro IS_SMRAM_PTR() — it used to validate all of the pointers readed from SMRAM — it helps to prevent unexpected crashes on unknown/unsupported firmware versions that may have different layout of certain SMM structures. Using this function we finally can obtain Boot Script Table dump on live system and check what interesting things it hides. As it was said in my "Exploiting UEFI boot script table vulnerability" article — UEFI specification (check "Boot Script Specification" document) covers only protocols used by firmware to access Boot Script Table contents and operation codes of it’s entries, but not the table binary format itself. Register physical memory address (that points inside Root Complex Register Block) is highlighted with green and register value is highlighted with yellow. These values are perfectly match values from CHIPSEC output that was shown above. The tricky part was about waking up the platform from S3 sleep on Windows operating system where libfwexpl works, on Linux it’s relatively easy to do this thing using rtcwake command line utlity included in all of the major distributives. However, it seems that on Windows there’s no any dedicated API or utility for that purpose. My first idea was about creating Task Scheduler entry — it has an option to wake up the system from sleep to execute specific task, but my friend advised me much more simple trick. If this parameter is TRUE, restores a system in suspended power conservation mode when the timer state is set to signalled. Otherwise, the system is not restored. If the system does not support a restore, the call succeeds, but GetLastError returns ERROR_NOT_SUPPORTED. As you can see, everything works just fine. Currently I haven’t tested this code on firmware of other computers, but as far as I can see, PRx flash write protection bypass attack should work on any Lenovo machines. In practice, there’s a typical to find a similar approaches for specific engineering tasks in firmware from different OEM/IBV companies, so, there’s a high probability that described attack can be used as generic way to turn SMM code execution vulnerabilities into the full flash write protection bypass (BIOS_CNTL and PRx) on wide range of computers available at the market. Also, I had some private talk with Intel security people and they say that technically this kind of design flaws which allow to disable PRx is not a vulnerability — their current threat model for IA-32 platforms implies that once the attacker managed to execute arbitrary SMM code, it's game over for flash write protection. I see some sort of irony in this point, as it was said above — the coolest feature of PRx registers is practical possibility of implementing strong flash write protection that doesn’t rely on System Management Mode code at all. In previous version of fwexpl_app it was necessary to specify the address of RegisterProtocol field of EFI_BOOT_SERVICES structure — it’s knowledge was needed to exploit the SMM callout vulnerability. In new version of the tool I implemented some binary heuristics which find this address automatically, so, you don’t need to specify it using --target-addr option or hardcode it into the g_targets array anymore. These heuristics rely on simple fact that during operating system execution there are still some runtime phase UEFI drivers present in system memory. For example, Windows kernel uses EFI_RUNTIME_SERVICES.GetVariable()/SetVariable() functions to implement functionality of NtQuerySystemEnvironmentValue(), NtSetSystemEnvironmentValue() and other similar system calls that used to access NVRAM variables. 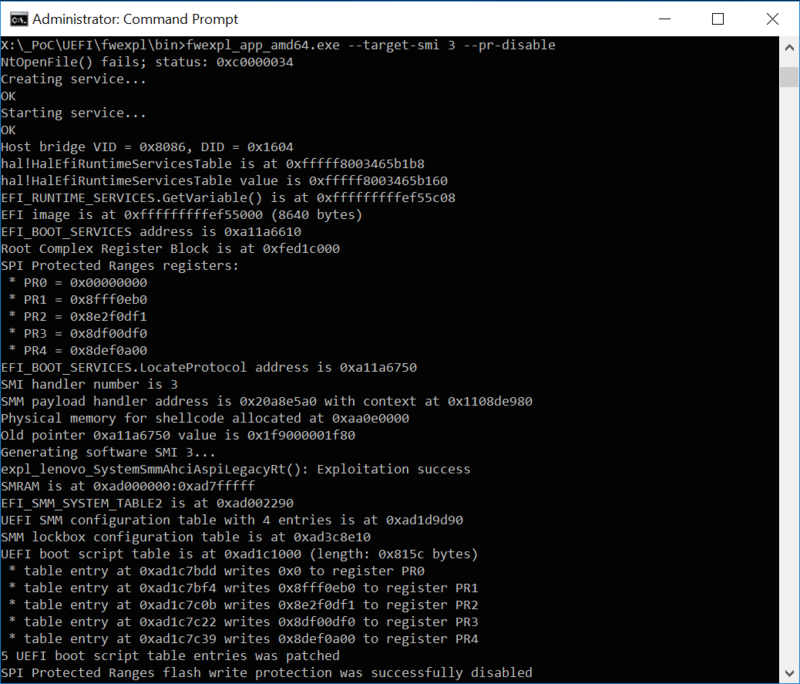 The EFI_RUNTIME_SERVICES.GetVariable() function itself is located inside LenovoVariableSmm UEFI runtime driver. If we check the entry point function of this driver we see that it uses gBS global variable to keep the address of EFI_BOOT_SERVICES structure — that’s exactly what we looking for! In addition I implemented a few other command line options that might be useful to play with the boot script attacks: --bs-dump that dumps contents of the Boot Script Table stored in SMM LockBox into the file, and --s3-resume that puts the system into the S3 sleep and wakes it up after specified amount of seconds. Very often firmware of real products available at the market is stucked somewhere between 1.x and 2.x EFI version, so, it’s quite typical to see relatively fresh code that still implements legacy protocols like EFI_SMM_BASE_PROTOCOL for compatibility purposes. After I met such legacy callback in SMM LockBox driver — I decided to find all similar callbacks used in actual versions of Lenovo firmware and check them for some interesting vulnerabilities. Register a callback to execute within SMM. This allows receipt of messages created with EFI_SMM_BASE_PROTOCOL.Communicate(). @param[in]  This                  Protocol instance pointer. @param[in]  SmmImageHandle        Handle of the callback service. @param[in]  CallbackAddress       Address of the callback service. be executed last in the dispatch table. require this, the state will be saved for all handlers. @retval     EFI_SUCCESS           The operation was successful. @retval     EFI_OUT_OF_RESOURCES  Not enough space in the dispatch queue. @retval     EFI_UNSUPPORTED       The platform is in runtime. @retval     EFI_UNSUPPORTED       The caller is not in SMM. any of the copies such that the data lives in boot-service-accessible RAM. @param[in]      This                  The protocol instance pointer. @param[in]      ImageHandle           The handle of the the callback service. @param[in,out]  CommunicationBuffer   The pointer to the buffer to convey into SMRAM. @param[in,out]  SourceSize            The size of the data buffer being passed in. On exit, the size of data being returned. Zero if the handler does not wish to reply with any data. @retval         EFI_SUCCESS           The message was successfully posted. @retval         EFI_INVALID_PARAMETER The buffer was NULL. InstallProtocolInterface() in the EFI 1.10 Specification. to the function that does some work. this code calls some function by address from obtained v3 structure field. As you can see — it’s quite epic! Firstly, it doesn’t have any input buffer filtering with hardcoded GUID comparison. Secondly, it calls external function which address was obtained from caller controllable buffer. To interact with vulnerable SMM callback we need to know it’s handle value, SystemSmmRuntimeRt driver entry point registers this callback using handle value (in context of SMM callbacks just think about it like about some random key without any exact meaning) of it’s own loaded image that was passed to it’s entry. SMM callback using EFI_HANDLE of it's own image that was passed to driver entry. Copy ThinkPwn project directory into the EDK2 source code directory. Run Visual Studio 2008 Command Prompt and cd to EDK2 directory. Execute Edk2Setup.bat --pull to configure build environment and download required binaries. Edit AppPkg/AppPkg.dsc file and add path of ThinkPwn/ThinkPwn.dsc to the end of [Components] section. cd to the ThinkPwn project directory and run build command. Vulnerable SMM callback function doesn’t look like any other SMM callback function from the same firmware, probably vulnerable code was written and committed not by regular Lenovo developers who usually work on System Management Mode. Vulnerable SMM callback function has absolutely no sense from engineering point of view, it can’t do anything useful except calling of arbitrary function which address was received from caller, there’s no any sane reasons to have such SMM callback in your firmware code. On other side — you should think twice before you will start to blame the Lenovo for System Management Mode backdoor in ThinkPad computers, we still don’t have enough of facts to claim that this issue is an actual backdoor (however, that’s the main idea of good backdoors). Patch for this vulnerability is currently not available, I decided to do the full disclosure because the main goal of my UEFI series articles is to share the knowledge, not to make vendors and their users happy. Also, I don’t have enough resources to check the vulnerability on all of the Lenovo computers, so, if you have ThinkPad — it’s likely vulnerable, in case of other model lines I’d recommend to wait for official advisory from vendor. It’s very unlikely that this vulnerability will be exploited in the wild, for regular customers there are much more chances to be killed with the lightning strike than meet any System Management Mode exploit or malware. 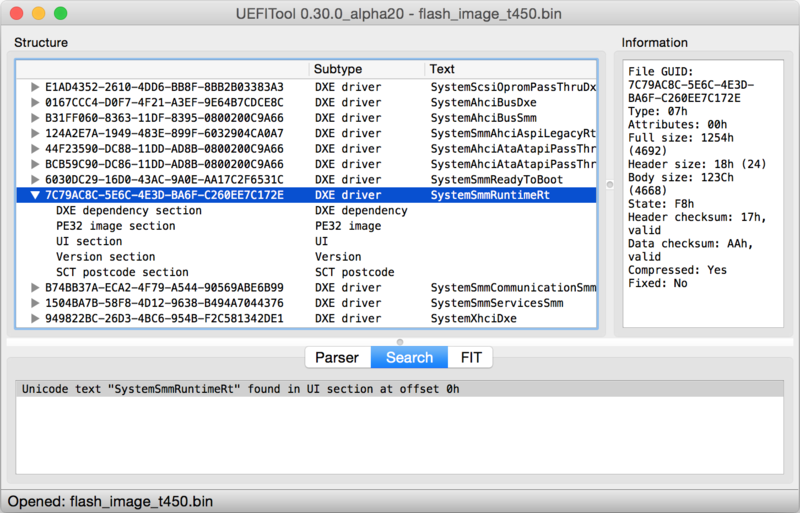 Currently exploit for this 0day vulnerability is implemented only as UEFI application — in theory it should work fine on any vulnerable machine which is good enough to test your system and dump SMRAM contents of fresh firmware for future research. Later I planning to reimplement it on the top of the libfwexpl, as it was said — it will be possible to use it for flash write protection bypass, disabling of UEFI Secure Boot, Virtual Secure Mode and Credential Guard bypass, etc.